The city of Freiburg in Germany will be attending the ICLEI World Congress 2015 in Seoul. Among the many great initiatives they have to share, one really stands out: their “Cycling Concept 2020” project. Cycling Concept 2020, launched in 2011 as part of a new transport plan, is hoping to ensure that by 2020, over 30% of all journeys will be made by bike. A small and traditionally eco-friendly city in Southwest Germany, Freiburg is a pioneer in sustainable mobility, drawing international attention for its environmentally-friendly policies. 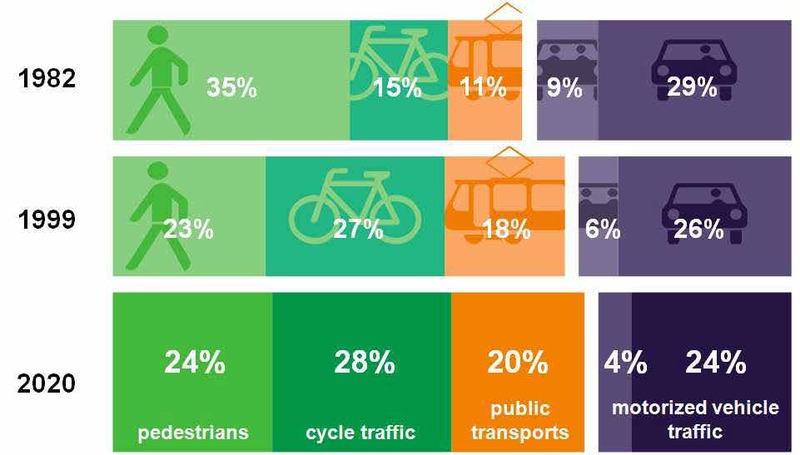 Its excellent public transport network and its forward-thinking transport plans have allowed it to reduce its inner-city motorized traffic to just 32%. What’s more, the city’s size and infrastructure make it a great cycling city with a vibrant cycling culture. 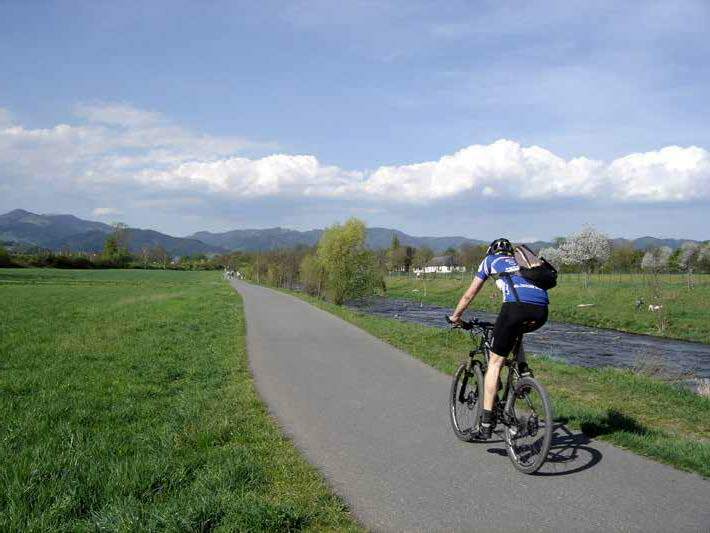 With 420 kilometers of well-connected cycle routes, 400 signs, and over 9,000 bike parking spaces, Freiburg makes sure that its residents can use their bikes for commuting as well as for leisure. The changing transport mix. Graphic by City of Freiburg. But Freiburg isn’t resting on its laurels. By seeking to increase still further the presence of bicycles as a mode of transport, the city hopes to deliver numerous benefits to its residents. The use of bicycles in winter, for example, will relieve the pressure on public transport services. Careful planning of routes will ensure that more natural habitats are preserved. And the project will contribute to the long-term goal of becoming a climate-neutral municipality by 2050. Separate paths have proved universally popular with cyclists. Photo by City of Freiburg. So what changes will be made? The city is placing a priority on separate cycle paths, allowing older but still active cyclists to avoid motorized traffic. It is also making the paths as wide as possible; avoiding bends; giving cyclists priority where junctions cannot be avoided; and sequencing traffic lights to favor cyclists. Although the paths will not be “cycle highways” in the Danish or Dutch sense, they will consistently give priority to cyclists. The priority routes will be complemented by main routes and secondary routes, ensuring that a complete network is available to cyclists. As part of its holistic approach, the city is addressing various cycling-related issues with concrete actions. These include increasing the number of parking spaces, opening one-way streets, conducting public relations and marketing activities, and funding regular maintenance for the cycle network. Looking beyond 2020, Freiburg is exploring the potential of electric bikes and Bike & Ride. The city’s Cycling Concept 2020 is an inspiring example of joined-up environmental planning. By making a long-term commitment, the city has allowed its planners and politicians to approach an environmental issue in a systematic fashion. Freiburg’s cycling infrastructure is a jewel in its crown, and we look forward to hearing more about it at the World Congress! To register for the ICLEI World Congress 2015, please click here.